Apparently I’m not the only one reading Martha Stewart Living in West Michigan. As I mentioned in a previous post, the feature about paperclay Christmas ornaments made with cookie molds in the December issue has become my latest craft obsession. I ordered the molds, but had to delay the project several days because my local craft store ran out of the Creative Paperclay I needed to make these babies. I finally got my hands on an 8 oz. package of it today and had a blast pressing the ornaments above with the girls. We have to let the clay dry over night before we can move on to the embellishment phase. This was my first time working with paperclay and I love it. It’s easy to work with and non-toxic, so safe for my little craft assistants. I recommend it if you’re looking for some low-maintenance clay for your next project. Stay tuned to see how our ornaments turn out. 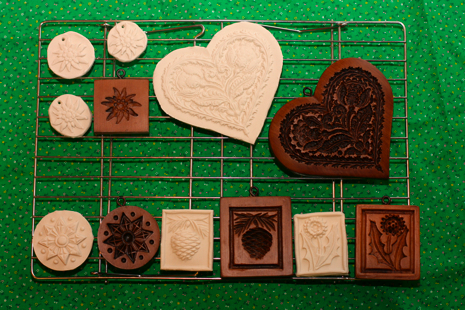 Soon I plan to use the molds as they were intended and press some gingerbread cookies. Love that gingerbread! To sign up, e-mail me your name and day-time phone number. Each participant must commit to making five ornaments to swap. The deadline to sign up is Nov. 25. The swap will be at our Dec. 9 Craft Club meeting at the David D. Hunting YMCA. The swap is open to the public, so tell your friends. So how are your holiday ornaments coming along? I’d love to hear what you’re making this year.